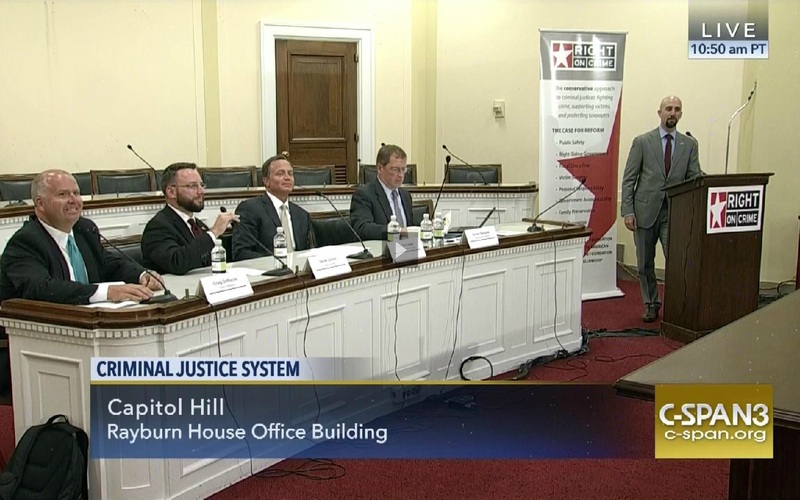 On July 5, 2016, prominent conservatives such as Craig DeRoche, Derek Cohen, Dan Schneider, and Grover Norquist all gathered in the Rayburn House Office Building as a part of Right on Crime’s "The Success of Conservative Criminal Justice Reform." Each of these men holds an important position within the sphere of conservatism. Craig DeRoche is a Republican and a former member of the Michigan House of Representatives. Dan Schneider is the Executive Director of the American Conservative Union (“ACU”). According to the American Conservative Union’s website, Mr. Schneider “is a lifetime member of the National Rifle Association, an Eagle Scout, a former board member of Americans United for Life and [has] served two faith-based missions in the Peoples’ Republic of China .” Grover Norquist is a tax reform activist and the president of Americans for Tax Reform. All these men hold right-wing values and beliefs, and they have come together to acknowledge that criminal justice reform needs to be implemented. The President of Americans for Tax Reform adds even more emphasis on conservatives being advocates for justice reform. He states “on a right-left coalition, there is no compromise on principles here. We’re working to do the same thing, perhaps for different reasons.” He adds even more compelling reasons as to why our liberties are being deprived. He talks about civil asset forfeiture and gives a startling fact that “there’s more money taken away from Americans through civil asset forfeiture last year than robberies.” This is a major restriction on American civil liberties, and it goes back to what Schneider talks about in regards to “depriving people of their liberty.” The government is doing a better job of “stealing” than the actual criminals themselves. The tales of government taking property do not end there as Dan Schneider tells the story of a man who had $40,000 worth of property taken away from him by the ATF. The Republican Party is the party in our two-party system that is supposed to stand for small government and limited spending. Efforts to reform the justice system demonstrate how conservatives are stepping up to uphold these principles. The list of conservatives in favor of justice reform is not limited to just these men, as many conservatives in Congress also are taking steps toward justice reform. John Cornyn, Mike Lee, and Jason Chaffetz are just some of those congressmen. Justice reform is currently supported by advocates from both sides of the aisle, but it’s the Republican Party that should fully embrace and lead in efforts which correspond to the idea of true freedom and liberty.